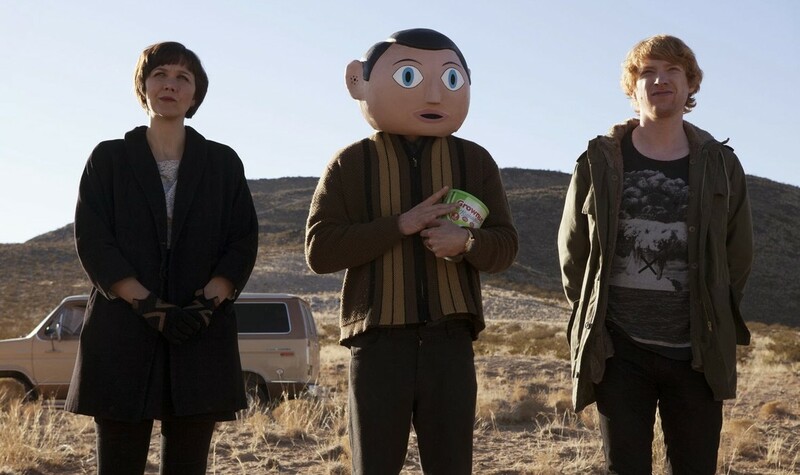 Weirdness abounds in the kooky film festival favorite FRANK, about an amateur musician, Jon (Domhnall Gleeson) who finds himself mixed up with some seriously strange bandmates, led by the mysterious and enigmatic Frank (Michael Fassbender as you’ve never seen him before). Based on the memoir by Jon Ronson (THE MEN WHO STARE AT GOATS) and his experiences playing with ultimate outsider musician Chris Sievey, FRANK is a surreal and funny paean to the musically odd and mysterious. Jon loves his new role in the unpronounceable British punk band, dubbed Soronprfbs. But he finds more chaos than success. Jon is a keener but finds himself tested by the bitter and tyrannical Clara (Maggie Gyllenhaal), who sees him as an unwelcome intruder, and bandleader Frank, a brilliant and troubled taskmaster who lives inside an over-sized papier-mâché head. FRANK is a moving love letter to outsider art, full of profoundly strange characters and thought provoking observations—propelled by a barrage of wit, performance, and, of course, song— from which you are bound to emerge, feeling as if you have seen and heard something completely original. "...chaotic, unpredictable, and utterly lovable"
"..brash and unflinching in its depiction of the creative process..."
The true story of a teacher chaperoning a school dance in the ‘70s invaded by a menacing motorcycle gang.